When it comes to pest control in Summerville, NEW-TEC is the name many people know and trust. We have been offering pest control, termite treatments and moisture services to Charleston, Dorchester and Berkeley counties since 1986. Pest control in Summerville has changed quite a bit over the years and Bonnie Reid of NEW-TEChnology Pest Management has helped to play a role in some of those changes. After working as a secretary with a national pest control company, Bonnie wanted to move into a supervisory role. But she was told that a woman could not do the job. 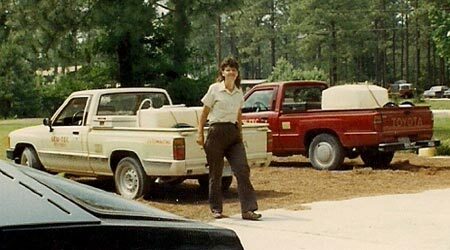 Bonnie Reid with NEW-TEC trucks in 1988. Believing she could do more for her customers in a safer and more effective way, Bonnie decided to start NEW-TEC, a pest control company in Summerville, SC. Not being deterred by the criticism and jokes , Bonnie signed her first customer in June 1986. When most other companies were spraying the baseboards on the inside of the structure on a monthly and sometimes quarterly basis, Bonnie started using a crack and crevice treatment on the interior with a good exterior perimeter treatment and only treating on a quarterly (once every three month) basis. While this was not common with other companies at the time, the treatment method worked extremely well. Over the years, the industry has changed and many companies now offer different variations of the quarterly treatment. However, NEW-TEC still strives to stay current on the most up to date equipment and treatment methods in order to control our customer’s insect issues while still using as little insecticide in the structure as possible. Over 25 years later we are a second generation locally owned and operated company. NEW-TEC offers pest control services in Charleston, Dorchester, and Berkeley counties. We have always emphasized on staying local and continue to offer our customers the benefits of doing business with a company that hires locally and supports the local economy. Unlike many companies, NEW-TEC also offers an experienced office staff. Everyone in our office has technician experience. This means when you have a pest problem all you have to do is call. You won’t have to wait for someone knowledgeable to return your call. With a combined total of 70 years of experience, we will always have an answer for you or we will know where to look to find an answer to your questions. 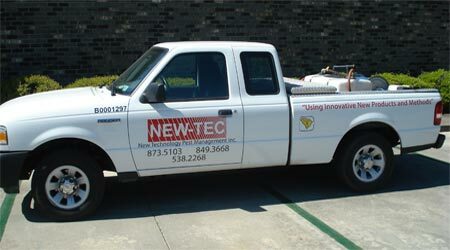 You can always count on NEW-TEC to get the job done. Click here to receive a free quote on pest control in Summerville, North Charleston, Charleston, Walterboro or anywhere in the Lowcountry. For faster service call our office at 843-873-5103 or 843-849-3668.